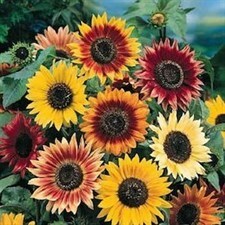 The dark centers of Red Sun's 5-6 inch flowers are surrounded by glorious warm bronze-maroon petals that are yellow at the base. 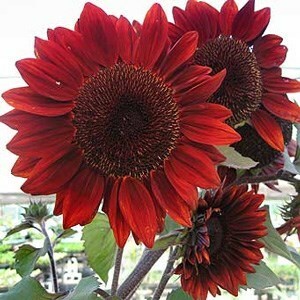 Slightly less intense red than Prado Red, it is also later, which extends the red sunflower season. The plants are 5 1/2-6 feet tall with 10 or more buds per plant. These are exceptional cut flowers with long stems, lasting up to 10 days in the vase. 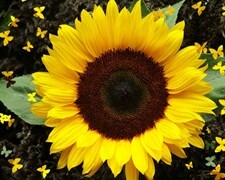 Helianthus annuus: (A) Sunflowers are impressive both in the field and in the vase, and the seeds make for pleasant eating; at least the birds think so! DISEASE AND PESTS: Watch for cutworms and weevils in the spring. A Pyrethrin powder, dusted or sprayed, works well for control. Avoid wetting the foliage to help prevent rust. Bird netting or flash tape will discourage birds. HARVEST: Cut flowers in the morning just after they open. Use a clean knife, a clean vase, and a few drops of chlorine bleach in the water, along with Floralife Cut Flower Food (ZFE272), to help maintain freshness. Cutting the mature central flower head will promote side-shoot flower production. Black-hulled sunflower seeds are a favorite with seed-eating birds. 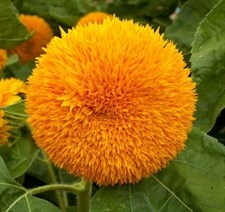 Harvest the heads when the bracts begin to shrivel, and hang the flowers upside down in a barn or shed. For seed-eating gardeners, gray and white striped sunflower seeds are the leading choice for munching raw, or roasted and salted. Harvest these the same way. SALTING: When dry, rub the seeds off the heads and soak overnight in 1 gallon of water with 1 cup of salt added. Drain, and then dry in a 250°F oven for 4-5 hours and store in an airtight container. GERMINATION CODE: Given at the end of each description to give you specific information.